Staff Sgt. 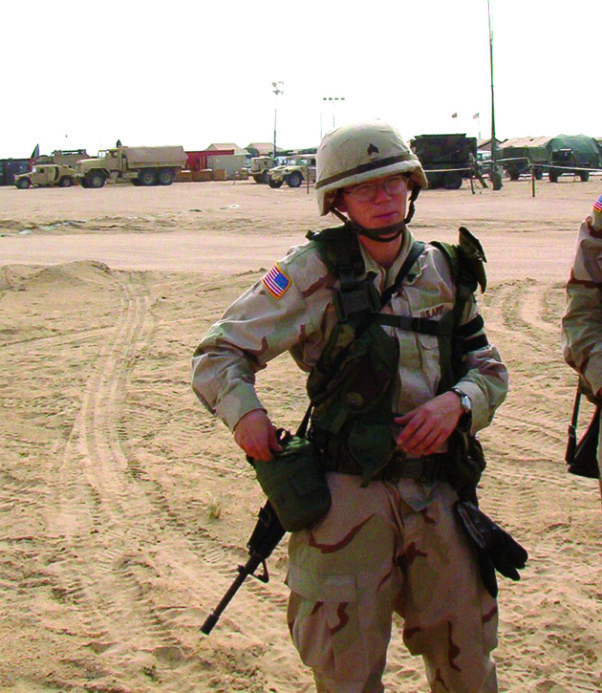 Stefanie Bradley, Alpha Company, 17th Signal Battalion, in a convoy in 2003 returning to Kuwait from Baghdad, Iraq. It was a typical cold, bleak winter morning in Germany. Dark clouds hovered just overhead, hugging the landscape. Soft, fluffy snowflakes drifted gently to the ground. Off in the distance, thin wisps of smoke floated to the sky and a faint smell of fireplaces burning permeated the air. I sharply inhaled the crisp air and shuddered as I hustled toward the post theater with my oldest daughter, Sydney, tugging her hand to keep her close. I stopped as she turned back to look at Justin, my husband, carrying our youngest daughter, Abby, in the baby carrier with him as he shuffled through the freshly fallen snow crusting the ground. He trudged along, his long brown hair flowing behind him, flecks of snow sticking to his goatee. We waited as he caught up, and then we burst through the door of the theater together, relishing the warm air pouring over us. I paused briefly in the lobby, soaking it in and trying to relieve the chill that had infiltrated the layers of clothes covering me. I glanced down at Sydney, pulling her closer, not wanting to let go. I wasn’t even gone yet, but my heart already ached knowing this was the last time I would be with my family for who knew how long. I took a deep breath, then pushed through the second set of doors and found dozens of Soldiers milling around. Some sat alone, absently rearranging their gear for the hundredth time. Others were laughing and joking with one another. Still others were huddled quietly with their families, anxious to spend every minute with them before the deployment. Looking around the theater, I remembered the day we got our deployment orders. Of course, it hadn’t really been news. Everyone had known that the Middle East was a hotbed of contention, and it would be only a matter of time. Still, even knowing the orders would be coming, it hadn’t quite seemed real until that moment. I glanced over at Justin, making his way down the aisle with Abby tucked snugly in her carrier, somehow sleeping peacefully despite all of the commotion. Barely six months old, Abby had no idea I was leaving. Justin, of course, could take care of himself. He may not have liked the fact I was going, but he knew exactly what was happening. Syd, wise beyond her three years, was truly an old soul and although that didn’t make the separation hurt less, at least she understood that I was leaving. Though she had no idea where Kuwait was, it was a place for her to associate with my departure. The strange, distant land where Mommy was going had an actual name, so it couldn’t be that far away. Abby, on the other hand, was going to be in for a rude awakening when she discovered I had abruptly disappeared. I thought that might be the worst part of the whole thing – not being able to explain it to her. I fought back the lump that formed in my throat, threatening to break my stoic exterior. I swallowed hard, forcing it back down to the tiny space where I kept a tight lid on all of my emotions. The sound of tapping on a microphone startled me, snapping me out of my thoughts, and I looked up at the stage to find the first sergeant standing solemnly, looking at the crowd. Everyone milling around began to herd-in their kids and take seats. I spotted my team and we headed over, slipping into seats next to them and their families, as the first sergeant began to speak. He thanked the family members in the audience for their support and briefed us on the schedule for the morning, then told us to say our goodbyes. Slowly, everyone began to file outside, gathering in groups around the buses to say their last goodbyes. We huddled close together and Justin leaned in, his lips crushed against mine and despite being outside in the biting cold, I was flooded with warmth. I hugged him tight, then unwillingly broke the embrace and turned to Syd, squatting down so she was at eye level. A glistening sheen of unshed tears brimmed in Syd’s eyes as I pulled her close. I took a deep breath to maintain my control. I had to be strong for Syd and show her that everything was going to be all right. I told her I loved her and hugged her tightly, never wanting to let go. I reluctantly released my grip and finally turned to pick up Abby. She had just begun to stir and her big, blue eyes slowly opened and focused on my face as I held her up, squeezing her close to my chest. I whispered into her ear and hoped that she understood what I was saying. Giving her one last kiss on each of her cheeks, I handed her to Justin, who stood to the side, tears streaming down his face. I picked up Syd one last time, then enveloped her with Justin and Abby in a group hug. Sadly stepping back, I picked up my gear and threaded my way through the sobs and the chorus of “I love yous” floating out of the crowd of family members saying their last goodbyes. I loaded my gear onto the waiting bus and climbed up the stairs, turning back one last time, catching Justin’s eye and flashing him a brave smile. He returned my smile with a weak one of his own, and I could see him fighting back the tears. I finished boarding the bus and glanced down the aisle, spotting a buddy just a few rows back. I made my way to him, slipping past to take the window seat. I sank into my seat and, as other Soldiers began stomping their way through the bus, I sat with my forehead pressed against the window, watching Syd scoop up the snow. She paused, looking up at the bus, tears still glistening on her cheeks, and spotted me watching her. She waved forlornly, the snowball she had been holding slipping from her fingertips and smashing into the ground. I gave a wave back, feeling like it was my heart that smashed into the ground instead. I was still staring, lost in thought, when the bus engine roared to life and pulled out of the parking lot. I’ve been out of the Army now for almost 14 years. There are so many things I loved about it. I loved being a Soldier — feeling like what I was doing was making a difference. I loved being a leader — training young Soldiers, mentoring them to become leaders, and watching them achieve their goals. I loved the camaraderie — my team was truly a family, and I’ll never forget any of my brothers. We worried, celebrated, laughed and cried together. Most importantly, we survived together. Despite all of the great things about the Army, there were also necessary sacrifices. Hard work and long hours can take a toll, but as a Soldier, leaving my family was always the hardest part of my job. I believe it’s even harder for those left behind — the families sending their Soldiers off to war. I had a whole family of Soldiers with me, while they were left standing in the parking lot, watching my bus drive off into the distance. 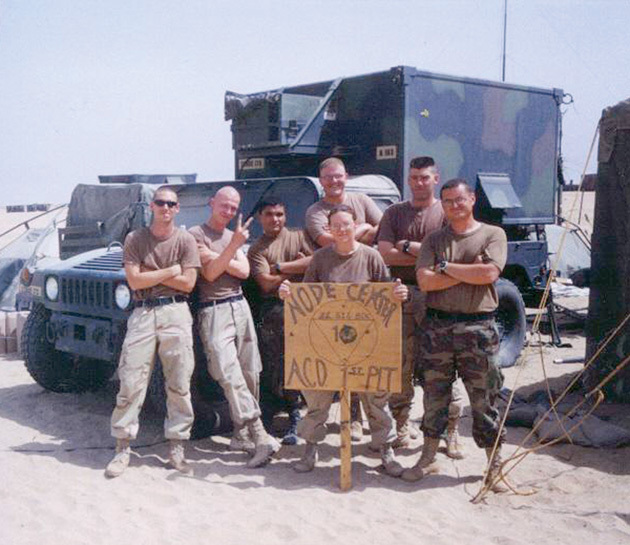 Bradley and her unit, Node Center 10, pose for a group photo in Kuwait. 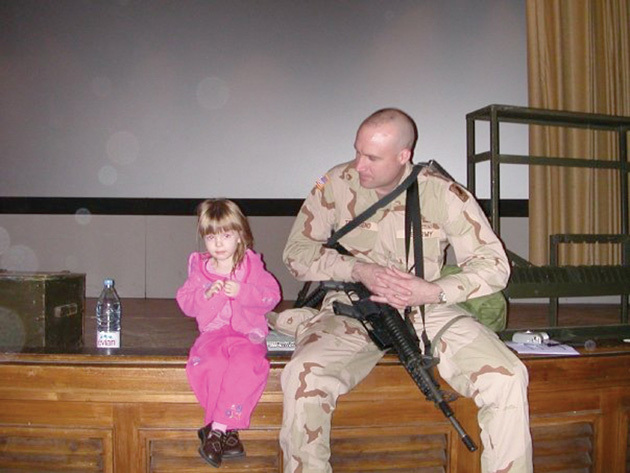 Sydney Bradley, 3, sits and stoically observes her surroundings as her mother, Sgt. 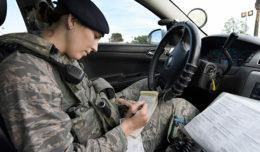 Stefanie Bradley, prepares to deploy with her unit.